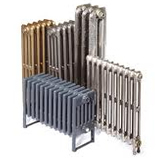 Cast Iron Radiators Ltd of Scarborough are the UKs largest manufacturer of Traditional Radiators. Their Cast Iron Radiators are exported to over 30 different countries and supply many of the companies in the UK that sell cast iron radiators. Their beautiful range of cast iron radiators is the widest available and have suitable cast radiators to fit any location. Many of their period castings can be found in historic houses and their traditional radiators have been used on TV sets and in films.